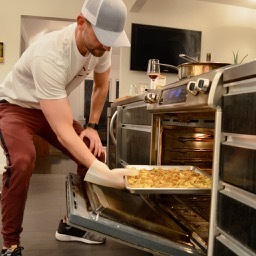 Fried, roasted, boiled, mashed, and now, smashed, potatoes are the TRULY “versatile” vegetable of our carb-fueled wet dreams. And like anything that is TRULY versatile, this dish is a real crowd pleaser. We dare you to find someone who doesn’t love this recipe. If you do, #PROTIP, back away slowly, and cut them out of your life, cause they probably mutilate stray cats in their free time. In a large pot, bring 4 quarts of well-salted water to boil. Add potatoes and boil for 10-15 minutes, or until tender. Drain potatoes. 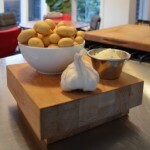 Grease a large rimmed baking sheet and spread potatoes out over the top. 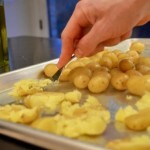 Using a fork, smash the potatoes flat and space them evenly on the baking sheet. 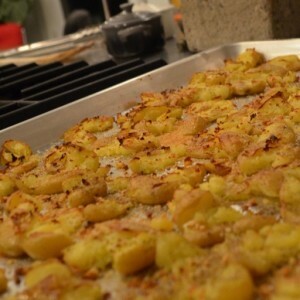 Drizzle with olive oil and lightly sprinkle the cheese, minced garlic, lemon zest, salt, and pepper over the potatoes. Place in oven and bake for 10 minutes, or until golden crispy.